Last month I covered Supported Decision-Making in general. One of the most difficult areas for children with disabilities to navigate is health care. Many times doctors will continue to speak to parents, rather than the teen or young adult assuming that they may be unable to respond accurately to questions. Find out how families can help their child self-advocate in the medical arena. Scheduling an appointment could be one of the easiest steps to take. It is best to schedule a follow-up appointment while still at the provider’s office. The parent could use a calendar (either hard copy or perhaps an app. on their phone) so the child can see which other activities are booked to avoid scheduling conflicts. Participating in appointments can be started early. Most children can answer the initial questions on their name and date of birth though some may need to practice this at home first. They can also answer questions on symptoms, especially the typical yes/no questions like, “Have you had any headaches? Upset stomach?,” etc. Family Voices WI has factsheets on preparing children for doctor’s appointments at http://parentsreachingout.org/cd/pdfs_en/hc003.pdf or Spanish http://parentsreachingout.org/cd/pdfs_es/hc003_es.pdf. As they get older, children can practice filling out forms. For children seeing multiple providers, it’s good to review at home the doctor’s name, specialty, and why they need to be seen. A brief list of questions prepared ahead of time also helps appointments run more smoothly. Medication adherence is the single largest factor in preventing rehospitalization. Medication alarms are available, and so are apps. for phones and tablets. Children may be able to use a pill organizer with supervision along with a medication schedule. A great online tool as well as app. is www.mymedschedule.com. 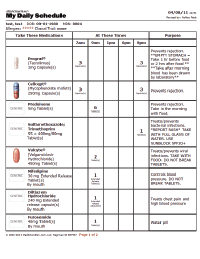 The schedule includes a picture of the medication, what it’s used for, and how much to take at what time. It has a list for refilling the pill organizer too. Another thing that older children can learn to do is call for refills. They should be taught to look for when the bottle is almost empty and how to call the pharmacy-most have automated systems that are easy to use by just keying in the refill number. It is important that families, and children, learn that they should ask for any interactions among medications. This means that certain meds may have to be taken separately from others. This is one of the most difficult items to navigate but again it helps if older children know why they’re seeing a specific doctor. They should know to share the information related to that condition. Again, they can start by answering simple questions by practicing at home and will learn how to answer harder questions as they get older. It’s a good idea to sign up for the doctor’s patient portal, if there is one. Here, all of the health information for that provider will be located in one place. It’s also a good idea to go over the after visit summary with the child to the best of their ability. Children with complex needs should get medical id bracelets. There are all sorts of trendy designs out now so children won’t feel like it stands out. 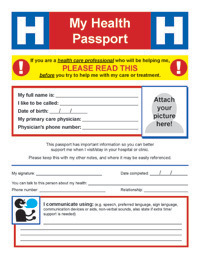 “My Health Passport is available” developed by AUCD South Florida, in available in English at http://www.spannj.org/cyshcn/core_outcome_6/Health_Passport_English.pdf and Spanish at http://www.spannj.org/cyshcn/core_outcome_6/Health_Passport_Spanish.pdf. Seattle Children’s Hospital has developed Care Plans for Teens at http://cshcn.org/planning-record-keeping/care-plans-for-teens/. Finally, self-advocates can use the Waisman Center’s “My Health Pocket Guide” at http://www.waisman.wisc.edu/cedd/pdfs/products/health/PG.pdf. There is also “My Health, My Choice, My Responsibility” which includes forms for health information, health plans, and appointments at http://www.ablelinktech.com/myhealth/ as well as an iPad app. at http://www.ngsd.org/news/my-health-my-choice-my-responsibility-ipad-app. The Boggs Center has “Being a Healthy Adult: How to Advocate for your Health and Health Care” in English at http://www.spanadvocacy.org/content/being-healthy-adult-advocating-your-health-and-health-care and Spanish at http://www.spanadvocacy.org/sites/g/files/g524681/f/files/TransitiontoAdultHealthcare-SP-complete_0.pdf. Learning how to self-advocate in health care is an essential step towards independence. Children with special health care needs must start this process early which will result in better outcomes for their health as well as increasing independent living skills. so i contacted DR LANO just to try his spell. and i was surprised that Dr LANO helped me cast the real LOVE RE-UNITE spell and My Husband came back after 38 HOURS of his spell and we have been living happily like never before. Life is all about good and bad experience. It was all good and lovely when i met jully, she was a good business woman until things become rough for her and her business empire started liquidating. I was a very courageous and hardworking man so i decided to sell my inheritance to assist . We both struggle together and built the business world again. This time around the business was growing from strength to strength. I was surprise one Sunday evening when she came home with her secretary and told me that we cannot continue with this pretense called love. I was shocked and heart broken, i was in a friend house for three weeks frustrated until i met jeffery my old friend at the supermarket, he directed to me to Dr Greg. I contacted Dr Greg and he told me that Jully was been manipulated by some spiritual power and he told me to provide some items which he is going to use to destroy the evil spirit. I never believe in voodoo but i had to give him a trial. To my greatest surprise, Jully called and started apologizing 2 days after i sent Dr Greg the email. I am very happy and will continue to be happy for the good work the Dr Greg has done in my life. Problems are been solved when good people like Dr Greg are on this planet, please contact Dr Greg through bestwishlover23@gmail.com if you need any support in any problems in life. Hi, I have been with my boyfriend (he’s a Japanese) for 3 months. He was a married man and has a daughter. He has been talking about divorcing his wife and choosing a life with me. He even told me how he wants me to be his future wife. Things were going beautifully great. Then one day, I was talking to my boss (whom I had an affair with before I met my bf) and we ended up flirting again and I got mischievous and sent him a naked photo. I forgot about this the following days and didn’t even think to remove any evidence of that text message. But last month, my boyfriend went through my phone and read everything. And told me that it will be our last day together. Hi I was in relationship for 5 year and 1 year of marriage now my husband is leaving me moving towards another apartment I came to know in last moment that he had signed new contract. I felt so shocked that he made such a big decision just like that he said that it's better for both of us because everything I do for him was bothering him he thinks I never put any effort to make him happy that I was just controlling him and he feels traped he wants to be free so n so I beg him to stay I even ask him to give me a chance he simply said it's too late.we have fought also to be together. I do love him more then anything i was really diver-stated when he left me... My life fell apart and since then i have been looking for anyway to get my husband back until a friend introduced me to this Dr that helped me to bring my husband back to me... His name is Dr JATTO and you can contact him via his Email; drjattolovespelltemple@gmail.com or drjattolovespelltemple@yahoo.co.uk or call him through his mobile number: +2347050270268 or contact him directly through his website: http://drjattolovespelltemple.webs.com/.. I'm so excited everyone me and my husband are back together again! My husband said he is now gay and he dose not love me any more after 4 years that we have been together. I was hurt and helpless after trying so many ways to make my husband take me back. One day at work, i was absent minded not knowing that my boss was calling me, so he sat and asked me what its was all about i told him and he smiled and said that it was not a problem. I never understand what he meant by it wasn't a problem getting my husband back, he said he used a spell to get his wife back when she left him for another man and now they are together till date and at first i was shocked hearing such thing from my boss. He gave me the contact of the great spell caster who helped him get his wife back, i never believed this would work but i had no choice then to get in contact with the spell caster which i did, and he requested for my information and that of my husband to enable him cast the spell and i sent him the details and he also told me the items which will be needed in casting the spell which i provided him money to get, after two days, my mom called me that my husband came pleading that he wants me back, i never believed it because it was just like a dream and i had to rush down to my mothers place and to my greatest surprise, my husband was kneeling before me pleading for forgiveness that he wants me back home, then i gave Dr Unity a call regarding the sudden change of my husband and he made it clear to me that my husband will love me forever, that he will never leave my sight. Now me and my husband are back together again and has started doing pleasant things he hasn't done before, he makes me happy and do what he is suppose to do as a man without nagging. Please if you need help of any kind, kindly contact Dr Unity for help and you can reach him via Email : Unityspelltemple@gmail.com or call him on +2348072370762"Katy Brown from United States. Hi everyone! so excited my boyfriend is back after a break up!After being in relationship with my boyfriend for 3 years, he broke up with me, I did everything possible to bring him back but all was in vain, I wanted him back so much because of the love I have for him, I begged him with everything, I made promises but he refused. I explained my problem to someone online and she suggested that I should rather contact a spell caster that could help me cast a spell to bring him back but I am the type that never believed in spell, I had no choice than to try it, I mailed the spell caster, and he told me there was no problem that everything will be okay before three days, that my ex will return to me before three days, he cast the spell and surprisingly in the second day, it was around 4pm. My ex called me, I was so surprised, I answered the call and all he said was that he was so sorry for everything that happened, that he wanted me to return to him, that he loves me so much. I was so happy and went to him, that was how we started living together happily again. Since then, I have made promise that anybody I know that have a relationship problem, I would be of help to such person by referring him or her to the only real and powerful spell caster who helped me with my own problem and who is different from all the other ones out there. Anybody could need the help of the spell caster, like of issue of not be able to get pregnant for many years, lotto, his email is Unityspelltemple@gmail.com or call him on +2348072370762 you can email him if you need his help in your relationship or any other problem like wining lottery your problem can never remain the same again, it will turn a thing of the past in your life.I am Rhonda joseph, I am a US citizen, 48 years Old. I reside here in Sunny-Dale Ave. My residential address is as follows. 1934 Sunny-Dale Ave,San Francisco,Ca 94134 , United States. who ever is reading this testimony today should please celebrate with me and my family because it all started like a joke to some people and others said it was impossible. my name is Juan i live in Chicago i am happily married with two kids and a lovely wife something terrible happen to my family along the line, i lost my job and my wife packed out of my house because i was unable to take care of her and my kids at that particular time. i manage all through five years, no wife to support me to take care of the children and there come a faithful day that i will never forget in my life i met an old friend who i explain all my difficulties to, and he took me to a spell caster and and the name of the temple is called, DR IDAHOISE, i was assure that everything will be fine and my wife will come back to me after the wonderful work of Dr Okorospelltemple, my wife came back to me and today i am one of the richest man in my country. i advice you if you have any problem email him with this email: dr.kellyidahoise@yahoo.com and you will have the best result. take things for granted and it will be take from you. i wish you all the best. My name is Veths Senaso, My boyfriend is back. We dated for 8 years and have been doing everything together. Until when he told me our relationship is over. I love him so much but he refused me, I felt the world has come to an end for me but my friend told me about a spell caster that helped her sister out in getting her relationship back, a good job and favor in any of her endeavor but at first, but I have no choice than to give Dr- Azazi a trial because I love my boyfriend very much and I am not willing to lose him to any woman. Now we are doing well and will soon get married. I love him to death and vice versa. I guess true love will really find its way back to you. I recommend Dr-Azazi to anyone who is having troubles in their love life. I wake up every day singing praises to this wonderful spell caster called Dr,UZOYA My name is brown Anan i am from United States, I was in a relationship with Ben and we loved and cherished ourselves for 3 good years and every thing was going on smoothly but February 14, 2016 a day i can call a lovers day we both had misunderstanding because i answered a call from a guy that is asking me out for a date but i refused,and he told me that the relationship is over and that he is fed up with me and i begged him because i love him so much but he refused me i was so down cast and i felt the world has come to an end for me but my friend told me about a spell caster that helped her sister out in getting her relationship back,a good job and favor in any of her endeavor but at first i was scared but i have to give this man a trial because i love Ben very much and i am not willing to loose him to any woman,so i ordered returning my love spell from this great spell caster that made me a happy woman again to say it all my ex came back to me with much love and a caring heart...i am testifying to this great spell caster Prophet of Goddess. if you need his help you can contact him on; [driraborspellcaster@gmail.com] OR call him on +2348151098492. Dr Yamaza you are the greatest spell caster that i believed is existing because you brought back my lover who left me over six weeks ago within 48 hours, Sir you are the greatest spell caster thanks for your great work in my life. And i will live to remember you for making my dream come to past thank you once again sir. My friends out there who needs help i will advice you to contact Dr.Yamaza for help here is Dr Yamaza email: address yamazatemple@yahoo.com and his mobile number +2349057260852. My name is Williams Lender i am very happy for the wonderful work dr Aziza has done for me i got married to my lovely husband last year and we have a lovely son. things was going well with us and we are living happily. until one day my husband started behaving in a strange manner i could not understand, i was very confused with the way he treat me and my son. later that month he did not come home again and he called me that he want a divorce, i asked him what have i done wrong to deserve this from him, all he was saying is that he want a divorce that he hate me and do not want to see me again in his life, i was sad and also frustrated i did not know what to do,i was sick for more than a week because of the divorce. i love him so much he his everything to me without him my life is incomplete. i told one of my child hood friend and she told me to contact a spell caster that she has listen to one woman who testify about dr Aziza and she has been hearing about him that i should try him i never believe in all this spell casting of a thing but i just say i should try if something will come out of it. i contacted Dr Aziza for the return of my husband to me, he told me that my husband have been taken by another woman. that she cast a spell on him that is why he hate me and also want to divorce me. then he told me that he has to cast a spell on him that will make him return to me and my son, he casters ted the spell and after a day my husband came back home and started apologizing he said that he love me so much that he did not know what happen to him that he left me. it was the spell that Dr Aziza casters ted on him that make him come back to me,right now am so happy again. thank you Dr Aziza for what you have done for me i would have been nothing today if not for your great spell. this is to every one who is facing divorces or heart break by your lover i want you to contact him now because he can do it for you his powers is great and don't have any side effect in the future contact him through his mail;drazizaspelltemple85@gmail.com contact him now and your problems will be solve for ever.once again thanks to dr AZIZA. I can't really believe that i am with my Ex-Husband after when he broke up with me with 4 kids he is back , i thank Dr Okedi for helping me getting back my husband back, My Name is Vegadaly i am from USA and my man name is Phillip , my happiness turn to bitterness,my joy turn to sorrow,my love turn to hate when my husband broke up with me last week,i was so frustrated and i could not know what next to do again, i was so unthinkable and i could not concentrate anymore, i love my husband so much but he was cheating on me with another woman and this makes him broke up with me, so that he can be able to get marry to the other lady , i think she cast a spell on my husband to make him hate me and my kinds and this was so critical and uncalled-for,I cry all day and night for God to send me a helped to get back my man until a day when i was browsing on the on the internet i saw a post of a lady name Lizzy Brooklyn and who was having the same problem with me but she latter got her Husband back and i write her to asked her how she was able to get her husband back and she told me that their was a powerful spell caster in Africa that help her with a love spell in getting back lost lover's back and i decided to contacted the same Dr Okedi immediately and she told me what is needed to be done for me to have my man back and i did it although i doubted it but i did it and the Dr Okedi told me that i will get the result after 4 days , and he told me that my husband was going to call me by 10pm in my time and i still doubted his word, to my surprise my husband really called me and told me that he miss me so much Oh My God i was so happy and today i am happily with my man again and we are joyfully living together as one good family and i thank the powerful spell caster , he is so powerful and i decided to share my story on the internet that good spell casters still exist and Dr Okedi is one of the good spell caster who i will always pray to live long to help his children in the time of trouble, if you are there and your lover is turning you down, or you have your husband moved to another woman, do not cry anymore contact the powerful spell caster Dr Okedi on his email: [okedisupernaturaltemple@gmail.com. and he will solve your problem for you , i am a living testimony and i will continue to testify of his goodness in my family,he turn my family to paradise and today we are all happy together Dr Okedi i say thank you in million times thanks Dr Okedi.